Richard & Mary Clipp Estate Auction — Harritt Group, Inc.
American Foursquare two-story eight room home located in vibrant downtown close to farmer’s market, restaurants, shopping and riverfront. Also selling the remaining contents including vehicle, antiques and collectibles. Auction held indoors and under tent. Turn of the century 2,750 square foot 3 bedroom – 1 1/2 bath two story home plus finished attic, covered front porch, basement and detached garage on easy to maintain city lot near downtown. 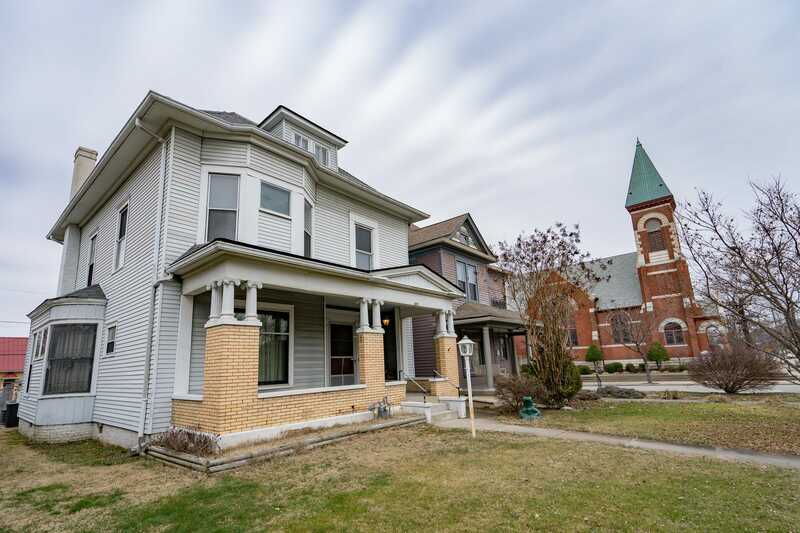 Stately home features period oak staircase with landings, wide natural wood trim and wood floors, 10’ ceilings, leaded and stain glass windows, 4 ornate fireplaces, aluminum siding, 2 gas furnaces and central air. First floor features spacious entry with fireplace & fireside bench, family room with 3 sets of wood pocket doors, office and formal dining each room adorned with their own fireplace, eat-in kitchen with butler’s pantry and back staircase, laundry-mud room and half bath. Second floor has 3 large bedrooms and 1 full bath, a spacious open third floor with vaulted ceiling, an unfinished utility basement with outside entrance to fenced back yard and oversized 1-car garage with alley access. Excellent opportunity for homeowner or downtown real estate investor. 1994 Plymouth Acclaim Sedan 4-Door, 71K miles. Selling the remaining contents including 1883 Morgan & 1923 Peace silver dollars, Zimmerman dish, double sided New Albany bus sign & Shopper Week, large collection of vintage Christmas decor, Imperial glass Christmas plates, New Albany memorabilia, advertisements, pin-up girl calendars, postcards, vintage wire racks and displays, vintage Superman toy and variety of 70-80’s toys, Beanie Babies, children’s books, character glasses, Walt Disney nesting blocks made in West Germany, World Fair items, sterling candlesticks, insulators, New Albany Hoosier bricks, Marlboro tin sign, salt & pepper shakers, vintage clothing, (2) 10K gold Masonic rings, costume jewelry, 8mm movie projector & cameras, 1940’s Crosley record player with radio, Kannaple’s milk box, vintage soft drink bottles & whiskey decanters, canning jars & zinc lids, spittoons, retro lamps & antique lighting, quilt, 1927 IU yearbook, Southern Living & Taste of Home cookbooks, Indiana history books, cross directories, figurines, frog collection, glassware, late Derby glasses, trivets, kitchenwares, ashtrays, Royal & IBM Selectric III typewriters, turntables, Datamate 100, sheet music, wood boxes, wood ironing boards, American Guild bell ringer sashes, shoe-shine kit, retro kitchen table, retro end table, metal utility cabinets, painted 5-drawer chest, oak office chair, gossip bench, walnut office desk, file cabinets, dome trunk, wood tool box, type cases, Singer iron base, card table & chairs plus large selection of box lots. Unopened 1960’s Very Old Fitzgerald with box. Assorted hand tools, yard tools and more. I-64 or I-265 to downtown State Street. East on Elm Street 3/4 mile to auction on left near 13th Street.